As summer turns to fall, successful broods from this year’s Northern bobwhite hatch begin to disperse and organize into coveys. This movement is known as the “fall shuffle.” Understanding why and when this occurs can give hunters an edge when deciding on their opening-morning spot or planning future habitat management. 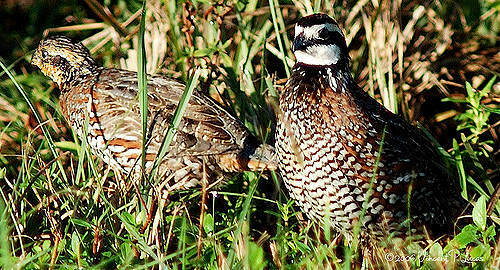 When undergoing “fall shuffle,” quail are looking for long-term food sources and suitable cover that are close to each other. This is important, as maintaining a close distance between the two lessens the chances of predation occurring. Habitat requirements for wintering bobwhites are a little bit different than the requirements for the spring and summer breeding season. Woody cover has become paramount, both for protection from the elements as well as predation. Woody cover also provides the covey an area used for loafing cover when not feeding. Covey headquarters normally has canopy cover with an open understory, which may be provided by vegetation such as shinnery oak, plum thickets, lotebush or skunkbush. Brush piles do not provide this cover. Many land managers have lamented the fall shuffle and the subsequent loss of birds it seems to bring. There will be some unavoidable losses of young birds following the end of nesting season; however, not all birds, or even a majority, will perish. Harvest ratios tend to indicate that 70 percent to 80 percent of birds harvested each year are juvenile birds hatched that year. If your winter habitat is not up to snuff, birds will vacate the area and move to greener pastures, so to speak. Quail are not a migratory species by any stretch, as most movements are short. But they will relocate to find the habitat needed to survive. When studying quail with radio telemetry, researchers have often had to use aircraft to locate the birds, with movement into adjacent counties and beyond not uncommon. Going out and conducting fall covey counts on your property can help you pinpoint where coveys are located on your place and see for yourself the habitat they are using. Go online to wildlifedepartment.com/outdoor-news/landowners-can-survey-learn-about-quail-numbers for a previous Upland Update that provided an excellent blueprint for performing fall covey counts on your property. Covey counts can give you a leg up on where to hunt and planning possible routes for having the wind at your dog’s favor, with the added benefit of estimating the number of coveys on the land you are hunting.